One of my favorite picture books when I was tiny was P.D. Eastman’s classic Are You My Mother? My mother claims that most of my first words were question words, so it makes sense that I’d like a book full of them. But I also think (from hearing her read the book to subsequent siblings) that I just liked the way my mother read – not in “voice” so much but emphasizing the interrogative so far that it became hilarious. She played it straight, but the child she was reading to always laughed. She also had so much patience with the book, which she must have read dozens of times. Anyway, I loved that book, and I’ve since gifted it to many friends’ children (who maybe didn’t have as many positive associations with it as I did)(oh well!). And when I read Alex Latimer’s Am I Yours? nearly the first thing I thought of was Are You My Mother? A heartwarming story of community, family, and finding your way home. A group of friendly dinosaurs helps a lost egg search for its parents after it’s been blown out of its nest. But if the little egg is to be reunited with its family, first they must discover what kind of dinosaur lies inside. What does that egg look like inside its shell? Surely, there must be a way to tell! This fun and unique tale featuring Alex Latimer’s signature bold art style will keep dinosaur lovers and fans of Are You My Mother? enthusiastically following along and guessing who is inside the shell. In this delightful picture book, an egg has fallen out of a nest and lost its way. It is pretty sure it’s a dinosaur, but it doesn’t know what kind – so it asks for help (the titular “Am I yours?”). Along its journey the egg meets all kinds of dinosaurs – from the Tyrannosaurus Rex to the Brachiosaurus, to Triceratops! Finally, with help from new friends the egg is identified and returned to the correct nest – just in time to hatch. This picture book is beautifully done. The illustrations in vivid pencil and finished digitally are very appealing, and the text is both familiar-fun (rhyming, options for lots of voices!) and scientifically accurate (proper dinosaur names included as a matter of course). 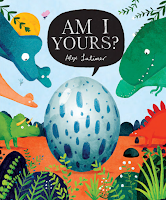 The pacing is spot-on, and while there are lots of repeated “Am I yours?” questions throughout to make an impression on younger readers, there aren’t so many as to make adult readers weary. Another highlight: as each type of dinosaur is eliminated there are identifying details shared, so readers learn about the characteristics that make each kind of dinosaur unique. There’s also a possible classroom science experiment tie-in, as the baby dinosaur is finally identified by light shining through its eggshell. I’ve seen lesson plans that incorporate doing this with chicken eggs, and Am I Yours? could work well as a read along for a unit of that nature. Am I Yours? will appeal to dinosaur-obsessed kids and parents who haven’t outgrown their dinosaur days yet (who has with a new Jurassic Park film every couple of years?! ), little ones with questions about family and how they fit into it, and anyone looking for a well-paced rhyming read that doesn’t condescend to readers, no matter how young. I can see it being adapted to board book form at some point as well. In all, Am I Yours? is sure to be a hit with the 3-6 year-old set, especially during any storytime! Recommended for fans of The Pout-Pout Fish and Are You My Mother?, and anyone looking for a fun, rhyming picture book for read aloud storytime. Fine print: I received an advance copy of this book for review from the publisher. I did not receive any compensation for this post. Aw, this sounds wonderful! My little godson is a scootch young for it, possibly, but it sounds right up his alley -- he loves Are You My Mother and loves predicting the pages before we get to them. He basically has it memorized!